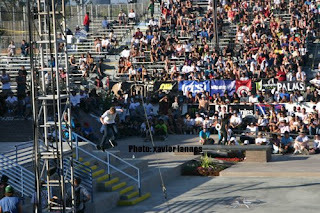 This is the second part of the coverage of the Maloof Money Cup in Costa Mesa and covers the street jams. To read about vert, check this blog with an entry on July 16 2009. The Maloof Money Cup offered an amazing street course, designed by professional skaters Geoff Rowley Lance Mountain, Braydon Szafranski with the assistance of Erik Ellington, Joe Ciaglia, Colby Carter and Mark Waters . It was inspired by real street spots, including the Barcelona Ledge (Spain), the Sunset up-down corner ledge on Sunset Boulevard in Los Angeles, and the Big Fours and 12-stair from Rincon in San Diego. In addition, the street course was featuring near replicas of Pier 7 and the Mission “3-up-3 down” in San Francisco, as well as UC Irvine’s 6-stair hubba and rails. The new bump-to-picnic feature was chosen by the Transworld Skateboarding Magazine's staff from thousands of entries and suggestions submitted to the publication’s web site. The winning feature was designed by Chris C. of Manalapan, NJ. It turned out that the product of their common design ended up to be a total destroyer of body and souls: the level of the obstacles being probably utterly too high. During the heats and the semis, each skateboarder tried so much to land the most insane trick that most of them could not even finish them and would end up smashed on the concrete like French crepes. I am not sure how the skaters are been rated by the judges, but seeing so many pros down on the floor so often gives an image of poor control and does not enhance the beauty and the purity of the sport. Seeing all those top pros down on the floor all the time made the contest cumbersome. There should be a system of negative point for each unfinished or unlanded movement that would serve as a deterrent for the skateboarders not to try to surpass their real level… But, men, when skaters would land their tricks, the people in the bleachers would go craaaaazy. That course was definitely the perfect storm-maker for the perfect contest to be “Skate & Destroy”. Anyway, the street contest started with the girls. Elissa Steamer came out swinging in the first 2 sections and was on top but eventually got stuck on a few moves on the Rincon area and she ended up into a well deserved 3rd place. Lacey Baker got on the podium with hardflips down the Rincon stairs and nose wheelie nollie heels out across the 3 up 3 down stairs. Lacey Baker snagged 2nd place and pocketed $6000 bucks for her efforts. But it was Leticia Bufoni, from Brasil, that walked away in 1st place and $25,000 richer. Leticia Bufoni ripped all three sections with smooth casual style and a big bag of tricks. The much anticipated and last event of the weekend was the Men's Street Finals and let me tell you that rookie Torey Pudwill is ready for some kind of next level here. He performed backside nose blunts across the Transworld picnic table, switch flip board slides and huge kick flips over the brick hip. Torey Pudwill killed it and in my opinion should have placed higher: he has the complete package with the biggest bag of tricks and one of the best flicks ever. Still, Torey skated well all weekend and being slotted into 4th place out of that starting grid is a quite impressive feat. As usual, Nyjah Houston was landing insane tricks all weekend: big spin front side boards and kick flip backside tail slides. He Pretty much has every trick possible on a rail. Nyjah was doing extremely tough maneuvers like he's been skating for 30 years, but that kid is only 14. He got on the podium for the second year in a row with a 3rd place. 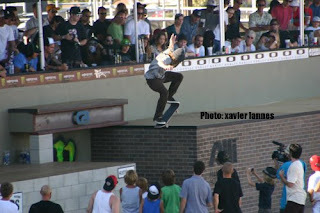 The crowd favorite might have been Tommy Sandoval with his balls to the wall approach. Tommy Sandoval was flying all over the place. 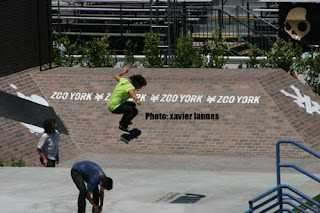 He skated the Rincon rail like it was a parking curb and pulled huge kickflips off the wall into the Zoo York red brick banks. A well deserved 2nd place and $30,000 was awarded to Tommy Sandoval. Unfortunately, only one guy can win the $100,000 prize and that guy was none other than Chris Cole. Chris Cole ended up destroying every section on the course by bringing his A game with him: lots of cab front blunts down the rail and switch 360 flips down the Rincon stairs helped get Chris into a 1st place finish.